Where can people view my videos and live streams? First, all of these options require that you access the PUBLISH SETTINGS tab for your content (as shown in the screenshot below). 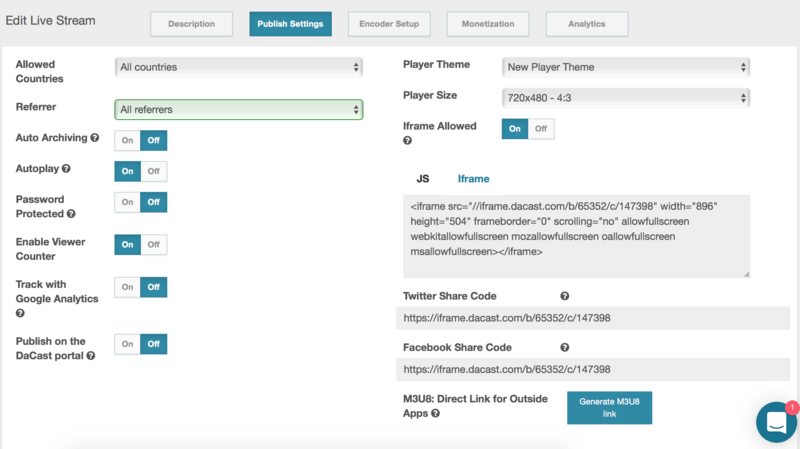 People can view the content on your website using one of the Embed codes found under PUBLISH SETTINGS. You will need to add this code to your website on the pages you want the video player to appear on. Using the Facebook and Twitter Share Code, also found under PUBLISH SETTINGS, you can share your video content directly on the social network. To do this create a wall post and insert the code into the post. When posted, an image with a play icon will appear. Someone can click this to have a video player appear. Please note that, unless a prior arrangement with Facebook is done, you can not embed monetized content on the network. Also using the Facebook and Twitter Share Code, found under PUBLISH SETTINGS, you can share your content on Twitter as well. To do this create a tweet and insert the code. Please note that right now after publishing your tweet you have to click on the link to access its video content. You can also send them a direct link of the video content. This can be done by copying the Facebook and Twitter Share Code and distributing it.